Keeping it simple is the name of the game with this salad — just super-fresh dressing and super-crisp romaine — for super flavor. 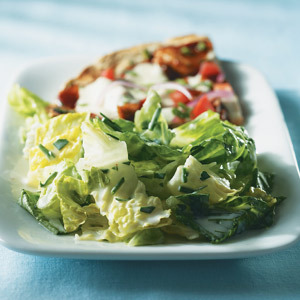 Serve these tasty salads as a side dish with Barbecue Chicken Tortilla Pizza. Whisk together buttermilk, sour cream, vinegar, honey, parsley, chives, salt, and cayenne pepper for the dressing in a bowl. Chill dressing until ready to serve. Toss dressing with romaine until coated; serve immediately.